The two Chapels are both physically and spiritually at the heart of the College. 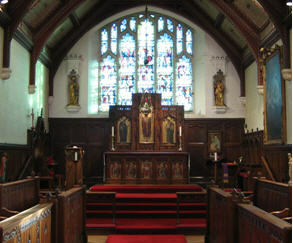 The Upper Chapel, which can seat 60 people, is a beautiful Gothic space, laid out in the traditional collegiate pattern. 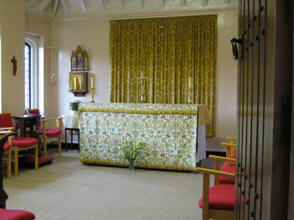 The Lower Chapel is smaller and more intimate. It has no steps within its sanctuary area, enabling Priests to continue to celebrate the Eucharist for as long as they wish and are able to do so. A series of original oil paintings by James Lynch of the Stations of the Cross hangs in the Upper Corridor. To see all fifteen paintings, and to find prayers to use with them, click here.The daily offering of prayer is one of the principal elements that give the College its special quality. There is a strong sense of community in the worship, and guests are always welcome. Prayers for those who ask are offered at the altar. If you would like to leave a request for prayer, for yourself or someone else, please click here. Other services include daily Morning Prayer at 09.30 and Compline which is celebrated on Monday evenings.